I picked this one up while listening to Barry read at the Decatur Book Festival in August. No seriously, he started reading and I fell so deeply into the story that I jumped up and bought it before they sold out. And then I got it signed. And then I read it in one day. And then I started freaking out that Billy Dent was going to come visit. Really REALLY looking forward to the sequel, out this year. It was hard to decide between this and Ask the Passengers, but ultimately I liked Lucky better as a narrator (Astrid is awesome too, but I just really loved Lucky). AS King is an incredible writer, and I’ll preorder any one of her books, regardless of the description. When I initially saw this book, I thought no way would I read it. Paranormal mystery at over 500 pages? But the writing was so great, the attention to historical detail so fine, the story so intense, that there was no way I could put it down. The perfect airplane book, because you won’t have to worry about finishing it on the plane, and the world is so amazing that you won’t notice the crying baby next to you. The swooniest book I read by far, with a nice twist and a great plot. This is the book I recommend the most of anything I read this year. Just beautiful writing and a total heartbreaking yet inspiring story. This is a perfect winter read, particularly if you’re snowed in (and I know some of you are!). It’s so incredibly atmospheric. I felt like I was living inside it while I was reading, which was sometimes wonderful and sometimes uncomfortable, but always perfect. A book that I was really excited about, that turned out to be not at all what I expected, that turned out to be better. I absolutely loved the writing and the storytelling in this one. And isn’t the cover perfect? Here’s a 500-pager that I read in almsot one sitting. This is dystopian/paranormal done RIGHT. I can’t wait for the next one. A perfect study of characterization, a really smart plot, and spectacular writing. I want every teenage girl in America to read this book. I read Shades of Grey in one sitting this year, and it would definitely be on this list were it not for the fact that I got a galley of Out of the Easy, which comes out in February. It’s the same perfect narration and scene setting that you loved in Shades of Grey, but I fell much more in love with this cast of characters. And as someone who used to spend summers in New Orleans, I loved hanging out in mid-century French Quarter. Favorite Character: Roux from Also Known As (Robin Benway) … This one comes out next year, and if you loved Audrey, Wait! you’ll love this one. Roux is hysterical, and I’m jazzed there’s a sequel coming so I’ll get more of her. Most Terrifying Character: Naughty John from The Diviners (Libba Bray) … The night after finishing, I woke up convinced Naughty John was in my house. I made my dog get into bed with me for protection. Biggest Tearjerker: Second Chance Summer (Morgan Matson) … I ugly cried while reading this, and went through a whole box of Kleenex. Best Cliffhanger: Burn for Burn (Jenny Han and Siobhan Vivian) … “I hope we get away with it.” Yeah, that’s the last line. Can’t wait for the next one! Sexiest Dude: Gansey from The Raven Boys (Maggie Stiefvater) … a smart, scruffy dude who carries a journal … Jess Mariano anyone? Biggest Reading Surprise: The Evolution of Mara Dyer (Michelle Hodkin) … I liked the first book fine, but the second? Couldn’t put it down! SWOON! First Book to Ever Make Me Happy Cry: Wonder by RJ Palacio … yep, the ending? Tears. For real. Best Cover: The Statistical Probability of Love at First Sight (Jennifer E. Smith) … love this cover, and so happy they’re mirroring it in her new one. But I just heard they might be changing it for the paperback? NOOOO!!!! Book I Most Want to Live In: tie between Dash & Lily’s Book of Dares (David Levithan & Rachel Cohn) and Reunited by Hilary Graham … can’t decide between Manhattan at Christmas or a summer riding around in a lime green VW van … don’t make me choose! Best Author I Discovered this Year: AS King … I will read anything she writes. ANYTHING. Lord knows I love John Green’s writing, but I think she does what he does and she does it better. BAM. 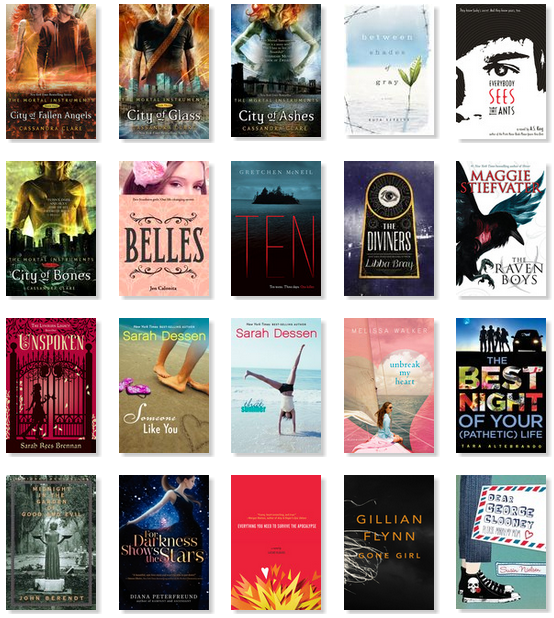 Below are all the books I read in 2012, if anyone’s curious. 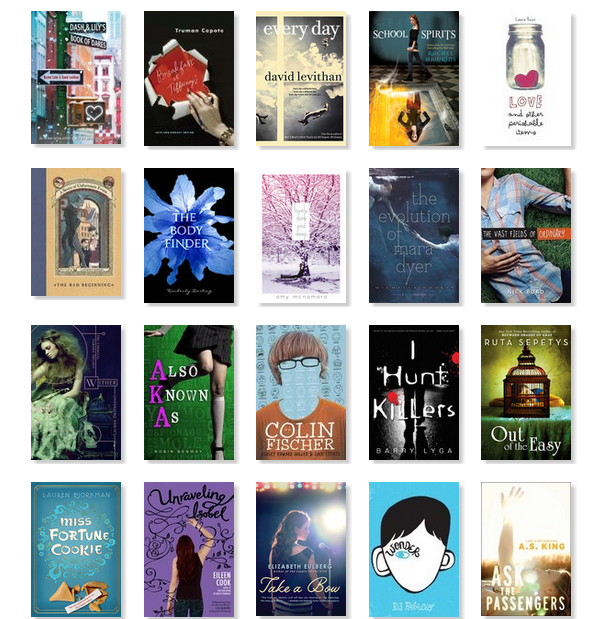 Thanks to Goodreads for helping me keep track and lining them up all shiny and pretty! Oh, and I’m a serious book quitter, so if I finished the book, you know I liked it! Thanks for the shout-out, Lauren! Those look like some pretty good reads. I will be adding a few to my list of Must Reads this year. My TBR was already too tall! Now it’s towering, monumental, absolutely terrifying.